The big playing field at spectacle! Today was the first time this summer I got to go to Spectacle island. Last year, I went a couple of times since I was on All Access, but this was my very first time this summer. Coming back to Spectacle was awesome because I remembered a couple of things we learned about the island from last year, so it was a refresher to hear all the things that I had forgotten, like how it was an island built on trash, and about the big bulldozer that sank at the very top of all the trash that used to be there, and so many more other cool things. Before we left to get on the boat I remember David telling the kids that whether they had been on the island before or not, to try and do something they've never done before. So I decided to try something new myself. Last year, every time I came to Spectacle I always did fishing and never really bothered to even try sports. So this time, I decided to go for it and play sports with the kids which ended up being way more fun than I imagined. We asked the kids which sport they wanted to play and they all ended up saying kickball so we broke up into two teams and played. 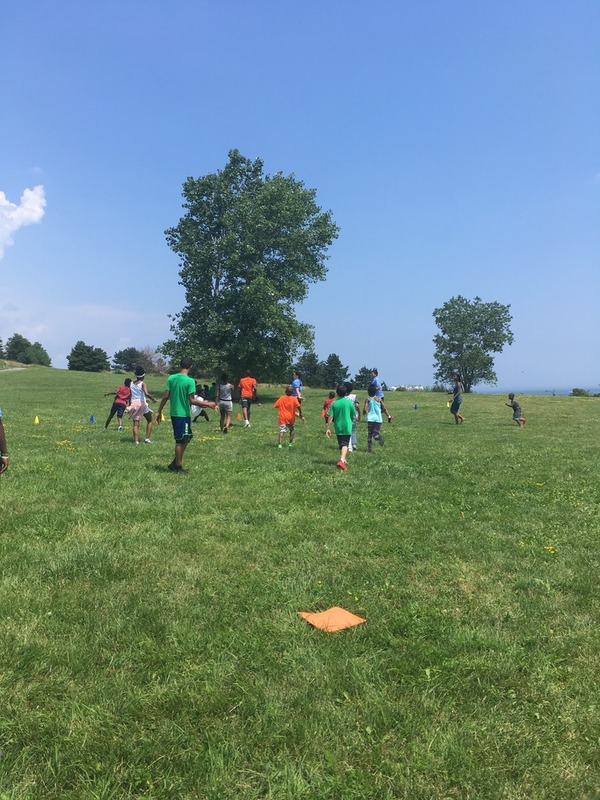 I didn't think the smaller kids were so competitive, but they were, which made the game not only a whole lot of fun but also very meaningful to them. After my team was losing 6 to 1, we stepped up our game and started making more home runs. It was nice to see how supportive the kids were of each other and cheering themselves on. Unfortunately my team lost with 6 points while the other team won with with 10 points. However, it was a very fun game and I enjoyed breathing the fresh Spectacle Island air and being out in the sun playing an awesome game of kickball with the kids. I couldn't have asked for a better way to spend the day at Spectacle. Most importantly I tried something I had never done before and so did many of the other kids, and that is all that really matters.